The performance of the Bannon Shopping Centre Portfolio in Q1 & Q2 has been very positive with strong growth in footfall and retailer sales over the period. 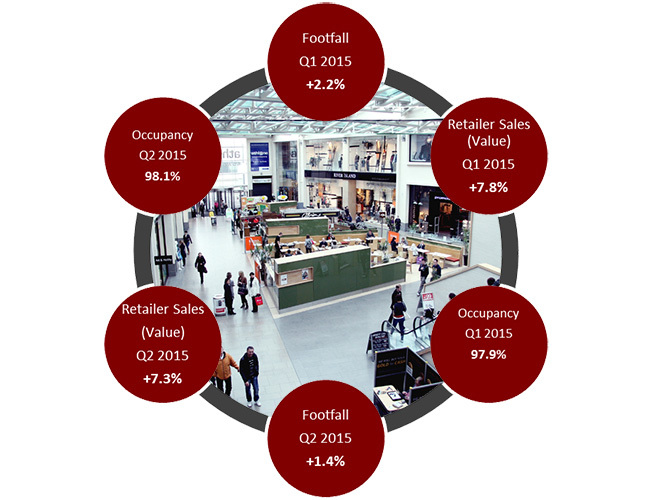 The combined YTD growth in footfall is 2.9%, versus a growth in retailer sales of 7.5%. The rate at which retailer sales is outstripping growth in footfall is quite impressive and means that spend per customer is substantially higher than the same period in 2014. This demonstrates a substantial improvement in consumer sentiment, brought about by increased disposable income. As is evident from the above chart the sustained recovery in the Irish economy has manifested itself across the Bannon Shopping Centre Portfolio during Q1 and Q2 2015. At present Bannon manage over 3 million square feet of retail assets with a total annual footfall of over 60 million people. The portfolio is made up of a range of retail assets, from large regional shopping centres to small local neighbourhood schemes. Ray Geraghty, Associate Director at Bannon noted that positive information seemed to find its way into the public realm at a much slower pace than negative information but that the figures outlined above don’t lie. When asked whether particular categories of retailers were performing better than others Ray noted that all categories had experienced growth but that the star performers were ladies fashion and jewellery, which underscores the fact that people have more disposable income. The consequence of all of the above is an improvement in demand for space and increased occupancy levels across the board, thereby strengthening the vibrancy of these shopping centres. Ray also advised that the growth was across the entire portfolio and a number of regional shopping centres had performed very well over the period, in particular Whitewater Shopping Centre in Newbridge and Athlone Towncentre Centre Shopping Centre in Westmeath.